CAIRO - An Egyptian court handed down prison sentences to three of the country’s most prominent youth activists Sunday in the first use of a controversial new protest law, a harsh warning to the secular groups that supported the military’s ouster of Islamist president Mohammed Morsi but have since grown critical of the army-backed government that replaced him. 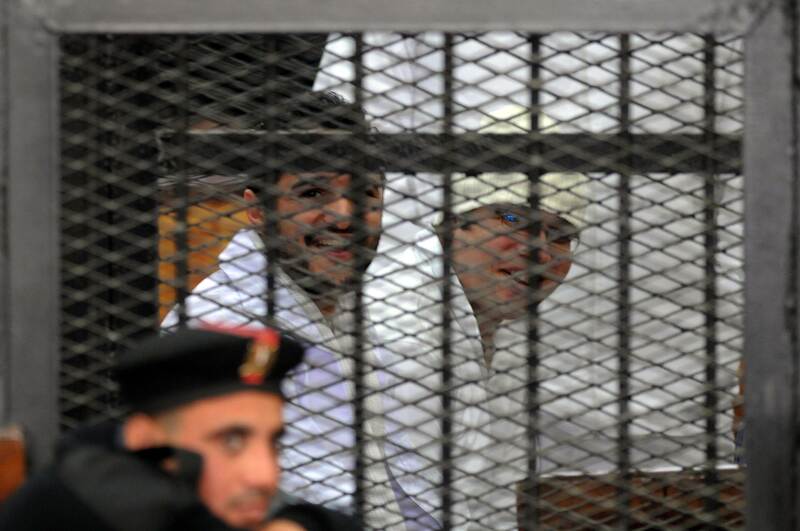 Ahmed Maher, Ahmed Douma and Mohammed Adel, founders of the April 6 movement, each received three years in prison on charges of holding an illegal rally and assaulting police. According to their lawyers, prosecutors said they had thrown rocks at police, but their defense disputed that they had done the throwing. It was the first prosecution under a protest law passed last month as part of the government’s efforts to rein in near-daily street demonstrations by Morsi supporters. Rights groups say the law, which levies harsh penalties for a variety of offenses linked to protests, shows intent to suppress all dissent. The government says the statute is necessary after three years of unrest that have devastated the economy. April 6 spearheaded the protests against longtime authoritarian leader Hosni Mubarak that began on Jan. 25, 2011, and led to his overthrow. 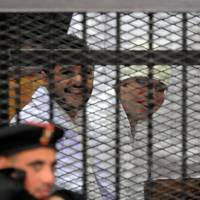 They also backed the military’s July 3 ouster of Morsi after another round of mass protests. But they were alarmed by the new protest law, many arguing it was more repressive than the laws in place during Mubarak’s time. Amr Ali, coordinator for April 6, said the new statute, under which another dozen members of the group face charges, is a continuation of a Mubarak-era policy, turning to a “security solution” to deal with political problems. “The youth of the revolution who call for freedom, democracy and their right to protest … are today tried unfairly and according to a dictatorial law that reflects this current regime and this current phase— basically turning against the ideals of the revolution,” Ali said in a news conference after the verdict. “We will continue to escalate against the protest law, against this repressive regime,” he said. He appealed to Cabinet ministers critical of the law to resign in protest. Defense lawyer Alaa Abdel-Tawab said he will appeal the court decision, describing it as “political” and “exceptionally harsh” for a misdemeanor court. The three were each fined $7,250. Heba Morayef, the group’s Egypt Director, said the prosecutions were the “beginning of a serious crackdown on the Jan. 25 generation of protesters.” She said the Interior Ministry, which is in charge of the police, blames them for its “loss of status” during the 2011 unrest, which saw the police routed in street battles and police stations attacked. The government for its part has described the law as an attempt to bring order and stability to the streets in the face of months of continued protests by Morsi’s supporters, and the security agencies have strongly rallied for it. The judges defended the law in court Sunday, rebuffing a challenge by the lawyers that it is unconstitutional. “The law was not drafted to deprive the people of their right to organize public meetings, and peaceful protests. It was drafted to organize this right” in accordance with the constitution currently in place, according to details of the ruling published on the state news agency. During the debate over the passage of the law, officials pledged that it will only be used to crack down on violent protests. The three activists were charged with holding an illegal demonstration and assaulting policemen in connection to a Nov. 30 protest. Maher went that day to a courtroom to turn himself in for questioning because he was wanted for holding an earlier protest. A crowd of supporters gathered outside, leading to scuffles with the police officers who later fired tear gas. Egypt’s state news agency said the ruling also included putting the three under surveillance for three years after they serve their term— an unusual decision, particularly against political activists. They had already been in detention and will now begin serving their sentences. Other secular groups planned protests Monday against the verdict and the law. Growing secular disenchantment with the government has been overshadowed by the confrontation between Morsi’s Muslim Brotherhood and authorities. Hundreds of Islamists have been killed and thousands jailed in the crackdown, with strong support from most of the media. Reflecting the general mood, most of Egypt’s private TV stations gave little airtime to the verdict. During an initial period of rule by military generals after Mubarak’s overthrow and under Morsi, arrests and trials of activists were extensively covered. Newspaper columnist Abdullah el-Sinawi said that after years of turmoil, a growing segment of the public has little understanding for the reasons behind continued protests, and little sympathy for the Brotherhood. Egypt is currently gearing up for a referendum on the constitution amended after Morsi’s ouster, and the third anniversary of the Jan. 25 revolution. In both events, Morsi supporters had said they will organize rallies. A coalition of his supporters led by the Muslim Brotherhood said Sunday it was calling for a boycott of the referendum, describing the amendment of the constitution as an attempt to bestow legitimacy on the military coup. The country’s Prime Minister Hazem el-Beblawi told a public gathering that it was time to rally behind the authorities’ plans, and put aside differences. “This is not the time to make demands, or to settle scores. This is the time to gather around Egypt and serve it, to sacrifice, to build,” el-Beblawi said.